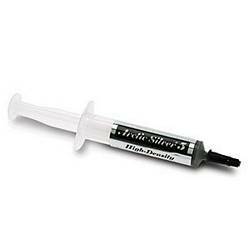 Arctic Silver 5 premium thermal compound, with 99.9% pure micronized silver, is specifically designed to maximize the thermal conductivity between today's high-power processors and high-performance cooling assemblies. Arctic Silver 5 uses three unique shapes and sizes of near-pure silver particles to maximize particle-to-particle contact area and thermal transfer. It can reduce CPU core temperatures by up to 50°F over standard silicone thermal pastes. Controlled triple phase viscosity allows Arctic Silver 5 to fill, over time, microscopic valleys and gaps in CPU and heatsink surfaces. One 12g tube can cover up to 85 CPU cores.